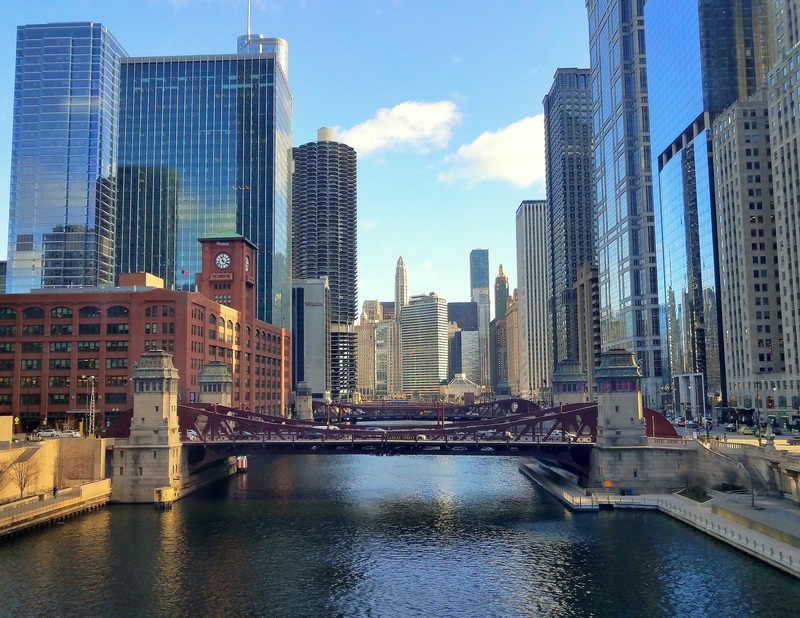 Ah, another glimpse of the downtown Chicago scene seen (*grin*) from the Chicago River! Can you see the numerous bridges that cross the river? The one you can prominently see in this photo is the LaSalle Street Bridge. I know I’ve said this before, but I want to say it again: the eclectic architecture works so well, don’t you think? To be honest, normally I’m a fan of uniformity where there is some kind of ‘tie-in’ to a cityscape. However, downtown Chicago’s mixture of old buildings, new structures, and everything in between somehow seems to work. The individual uniqueness of each building in and of itself doesn’t seem overshadowed by the next building, or the next, and so on. Perhaps that’s the tie-in; each structure brings a much-needed original design to the puzzle, and that puzzle isn’t complete without the sum of all its parts. I mean, what’s not to love about a ‘corncob’ placed near a stately structure sporting a clock with roman numerals at its peak? Not a thing wrong with that I say; not a thing! Ha that’s definitely a corncob! People still read newspapers? Actually, I came across one the other day in a Subway shoppe. The corncob building is a sharp contrast the straight lines of the newer buildings. Don’t change a thing! I just booked my stay in August… seeing your pictures makes me even more excited… can hardly wait!!! Chicago is and always was a great city for architecture, specifically because you do see so many different styles beside each other. I can remember when The Prudential Building was the tallest building in the city. Within ten years, it was dwarfed by The Hancock and Sears Tower. Now, it’s a veritable midget. I always wanted to live in Marina City. Still do, although I probably won’t. Wow. Full stop. Love your work. Cher, one of the things I like so much about Chicago is its magnificent variety of architectural styles. That “corn cob” building is definitely a throw-back to an earlier style that has not stood the test of time well, but it adds greatly to the mix.